The original Line Rider was a Flash and Microsoft Silverlight game that premiered on DeviantArt and caught on like wildfire. 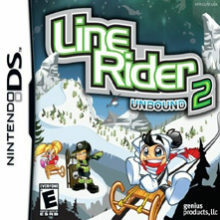 Line Rider 2 Unbound is the new version of the game available on the DS, Wii, and PC. After playing the DS version, I’ve got to say, it’s no wonder that this game caught on like it did. Line Rider 2 is a brilliantly fun and well done game and it’s so simple. This is a physics based game in which you have a character named Bosh that rides a sleigh on drawn lines. At certain areas, there are green boxes in which the player draws in their own line to get Bosh to the next part of the course until he reaches the finish line. Since the game is physics based, you have to make sure that your line is smooth without any ill-placed breaks to make sure that Bosh doesn’t fall off of his sleigh. Line Rider 2 differs from the original Line Rider in a few notable ways. Most obvious, is that it is now on the DS and Wii as well as the PC, so you can get away from you computer for a bit. I have to say, for the DS, that this is one of the most addictive portable games I have ever played. The gameplay is so simple that it’s brilliant. Line Rider 2 is on the level with Tetris, so simple –well, if physics can be considered simple, which I’m pretty sure it isn’t, but drawing lines that act like they’re affected by gravity and friction is simple….theoretically. Anyway, it’s addictive like Tetris is addictive and has enough difficulty to make you appropriately frustrated at times. Not enough to, say, throw a DS across a room, but enough to keep you trying to beat the same seemingly-simple level for more than half an hour. You’ll be determined enough not to give up on it despite the fact that riding through takes less than a minute, but drawing the friggin’ lines right to get Bosh to the finish line took forty-five friggin’ minutes….at times…for me. Ah, yes, and the fact that there is finish line is another way that the second game differs from the original Line Rider. In the first game you could keep drawing and drawing lines and there would be no end, sand boxing at its best, I suppose. In Line Rider 2, you can only do that when you are creating your own course (in Puzzle and Freestyle mode). Actually, if you created your own course it could probably go on for a very long time, but endless is likely a stretch. If you’re into making your own levels in games, then you can run wild with Line Rider 2 and all of its line types. If you’re into making your own levels in games but aren’t good at it, then probably steer clear of the freestyle and puzzle modes, unless you’re planning to make something really easy. Trust me, making your own level and making it good takes talent, I know, I can’t do it. For those sadistic people who would take the course making as an opportunity to torture hapless gamers, simmer down there, because once you make your own course, you have to play test before you can make it available to other players. If you can’t beat your own course, then you can’t upload it for others to play. The story mode is the only one where you ride your sleigh along a pre-designed course. In story mode you play as Bosh and make your way through acts which are made up of about five courses each. At the end of each act there is a pre-rendered video of Bosh and the other characters in their “storylines.” Story mode is really just arcade mode as opposed to make your own course mode, if truth be told. Calling it story is really kind of stretching, but there are events that occur at each act, so I guess saying that the story isn’t terribly fleshy would be more accurate. Forgive my criticism of the story, it is sometimes amusing, if somewhat disjointed at times. In story mode there are lines already drawn to make up the course, but there are also green rectangles throughout the course where the player must draw in lines to get Bosh to the finish line. The first few courses are very simple and seem to be more like a tutorial just to get the player used to the game. Once you get around a third or halfway through the game, then some of the courses start to get really complicated. At this point you might end up spending half an hour or more on one course, especially on the TechDawg challenges. TechDawg challenges are like boss battles, except you’re taking on more challenging courses on the last course of each act. One of the really tricky things about drawing in the lines is drawing in the right direction. Usually you’ll draw left to right and the line will be fine, but at times you may need to draw right to left to have the line aligned properly. If you draw the line the wrong way then it will be upside down and Bosh’s sleigh will act as if it wasn’t there. The sooner that you figure that this is the reason for him falling through lines sometimes, the better off you’ll be. Oddly enough, you can flip the line right side up, but you can’t change the direction that Bosh will go on the line. There are almost ten types of lines that can be drawn. The lines are normal, acceleration, slow down, destructible, trigger, trap door, scenery, trampoline, and finish line. The normal line abides by normal physics, acceleration and slow down are self-explanatory, destructible lines crumble away once you ride over them, trigger lines trigger a special effect like a trick or zoom, trap door lines disappear after you ride over them, scenery lines are used for decoration, trampoline lines launch your sleigh in a bouncing motion, and the finish line marks the end of the course. All of the line types can be used in freestyle and puzzle mode, but you are limited in what you use in story mode. You’ll see all of the line types, but you only use the normal, acceleration, and slow down lines to complete the course. Your lines can be drawn freehand or Bezier-curve style. The curves will make the smoothest lines so that you can be sure that the line isn’t too jagged, so you may end up using that method most. Once your line is drawn, you have other tools that you can use to change it or get rid of it completely. The eraser has about three sizes and you can use it to erase lines of all type, or you can change it so that it will only erase a certain line type. To make changes to your line there are two tools: there is line manipulation tool that lets you change the direction of the line or move the whole line and there is a vertex manipulation tool that lets you change the shape of your line by moving around its vertices. On each course there are gold tokens and orange targets to pick up. Even if you reach the finish line you won’t complete the course unless you’ve collected all of the targets, but the tokens are optional. Collecting the tokens yield surprises once you obtain the required number. It’s hard enough to get to the finish line sometimes, much less collect all of the coins or tokens, but I wiled away many hours doing exactly that. Maybe others will be able to resist the pull of this game better than I, because I failed miserably and was sucked into a Line Rider 2 vortex. It may be necessary for me to say that this gameplay is flawless. Well, when you have a simple concept, it makes it easier to get the important stuff right. All of the graphics are extremely simple, but the focus isn’t on final fantasy-esque cut scenes, so can’t really fault it too much, can I? The graphics are not what you’ll be focusing on here anyway. The music is...really weird, actually. The songs are the kind of weird that you expect would get really annoying really fast, but they didn’t. Go figure. You ride a sleigh over lines and loops and such. Plus there are more line types than you can shake a twig at. It’s like a puzzle game. These never really get old.